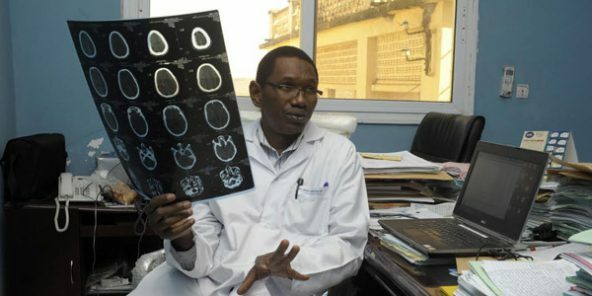 Malian physician probes genetic disease - Africa M.E. The only doctor in Mali who studies rare genetic diseases is the recipient of a grant of more than $1 million to further his research. Guida Landouré, who trained as a neurologist in Mali, the United States and Britain, was awarded funding for four years by the Human Heredity and Health in Africa (H3 Africa) fund, an initiative sponsored by the United States and the United Kingdom to support genetic research in Africa. Landouré, who is based in the neurology department of University Hospital Center in Bamako, divides his time between seeing patients at the hospital and conducting research on 123 families at the center of his research protocol. Genetic disease in Africa has long been overshadowed by the continent’s challenges with infectious diseases, Landouré and other researchers said in a paper published earlier this year. However, they noted, genetics may play a significant role in increasing vulnerability to infectious diseases and increasing resistance to treatment. They said research in Mali has already revealed disease-associated mutations but more study is needed to increase understanding of the functions and interactions of different genes. They argue that Africa is the logical place to focus genetic research. “Because of the population diversity in Africa and the limited studies done on the continent, genetic and genomic research in Africa will answer health questions that cannot be solved by studying other populations.” In Mali, Landouré is at the forefront of this research. Because African families tend to have more siblings than in Europe, sampling can detect defective genes more quickly and develop treatments of inherited diseases more effectively, he said. He said the Malian research would investigate genetic defects that cause hereditary neurological disorders, such as epilepsy, which is a major public health issue in the region. He said funds also would be used to support a bioinformatics network that will use computers to collect and analyze genetic information. Landouré became interested in genetic research by happenstance. As a doctor at University Hospital in 2002, he met visiting officials of the U.S. National Institutes of Health. Since neurological studies were not available in Mali, he opted to take a research position in the United States in 2004 and went on to study in London. He returned to Mali in 2010 to become the only researcher working on rare genetic diseases. For four years, the research will be funded with a grant of $1.1 million from the H3 Africa initiative. A partnership between the National Institutes of Health and Wellcome Trust, a London-based global charity, the project has committed $37 million for genetic research on the continent. The African Society of Human genetics has acted as the organizing partner for the initiative as well as providing a forum for genetic scientists in Africa. In addition to supporting genetic research, the project aims to expand research capacity on the continent through improvements in facilities and creation of new collaborations among researchers in Africa, the United States and Europe.